The 2017 edition of NFPA 654 provides a comprehensive approach to managing fire and explosion hazards involving combustible particulate solids and hybrid mixtures. Tragic experiences in the United Stated attest to the need for detailed regulations on dust hazard mitigation. NFPA 654: Standard for the Prevention of Fire and Dust Explosions from the Manufacturing, Processing, and Handling of Combustible Particulate Solids is referenced by OSHA's Combustible Dust National Emphasis Program (NEP) for the purposes of identifying dust hazards and defining mitigation strategies that protect life and property. The 2017 edition of NFPA 654 presents the latest protocols. The 2017 edition of the Standard provides fundamental, industry-recognized safety practices for facility and systems design, process equipment protection, fugitive dust control and housekeeping, ignition source identification and control, fire protection, training and procedures, inspection, and maintenance. Although the requirement to perform a hazard analysis has been part of the Standard since the 2006 edition, this 2017 edition of NFPA 654 includes requirements to perform a dust hazard analysis (DHA) retroactively for facilities constructed prior to the 2006 edition. The 2017 edition of NFPA 654 works with first-time NFPA 652, to help users identify dust hazards and establish the most effective control measures for the hazard and the type of facility. 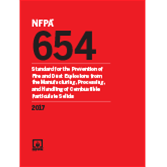 This 2017 edition of NFPA 654 contains changes that help align the Standard with the 2016 edition NFPA 652: Fundamentals of Combustible Dust -- the industry's first Standard with general provisions for managing dust hazards. Definitions in new NFPA 654 are aligned with those in NFPA 652, and the objectives in Chapter 4 have been updated. Interested in other editions of the NFPA 654? Use the drop down menu above to select the edition year you need. 4.1 Process and Facility Design. 4.2 Dust Hazards Analysis (DHA). 4.5 Pneumatic Conveying, Dust Collection, and Centralized Vacuum Cleaning System Design. 5.4 Evaluation of Proposed Design. 6.2 Segregation, Separation, or Detachment of Combustible Dust Handling and Processing Areas. 7.4 Specific Requirements for Systems that Convey Metal Particulates. 7.5 Systems That Convey Hybrid Mixtures. 7.12 Air-Moving Devices (Fans and Blowers). 7.13 Air-Material Separators (Air Separation Devices). 9.1 Heat from Mechanical Sparks and Friction. 9.5 Open Flames and Sparks. 9.6 Process and Comfort Heating Systems. 10.4 Hose, Standpipes, and Hydrants. 10.6 Spark/Ember Detection and Extinguishing Systems. 10.7 Special Fire Protection Systems. 10.9 Impairments of Fire Protection and Explosion Prevention Systems. 11.3 Initial and Refresher Training.